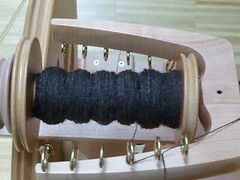 Last year when I started spinning again I really didn’t expect how happy it would make me. I’m still struggling with my spinning, I’m still not content with what I get but then I started spinning a bit more than ten minutes twice a week, and I started knitting with my own yarn. And it’s making the most amazing difference. And now that I’ve actually sat down to write about it I find that I can’t really describe it. 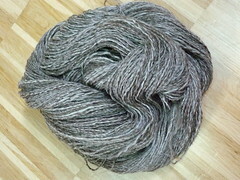 The yarn isn’t that much more beautiful, and it still is uneven and looks very – handmade. But somehow I’m enjoying every stitch. 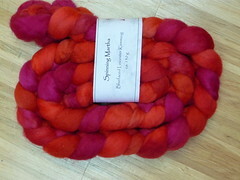 This handmade yarn has much more personality. I felt the same way about the first thing I ever made out of my own yarn, which is why I called it the “happy hat”. 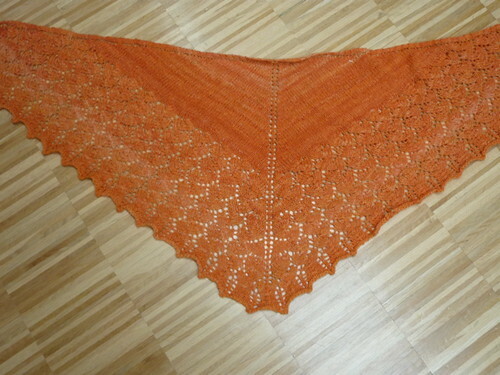 But now I have made three small shawls out of yarn that I spun and I enjoyed knitting them in just the same way. 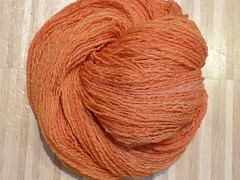 Even though the orange merino/silk-blend was supposed to become an Aeolian. 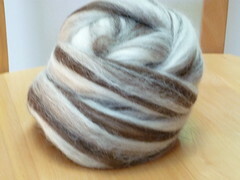 And I didn’t manage to spin it fine enough, so it became an Ishbel instead. I seem to be on an Ysolda-spree right now. 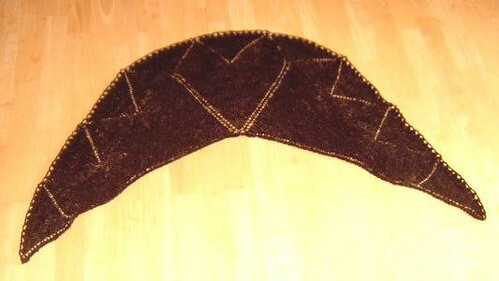 I have two of her sweaters in the making, and have just finished two of her shawlettes. 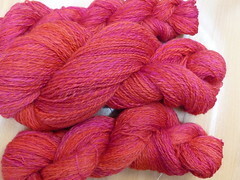 And this is some Corriedale, again from “das Wollschaf“, made into a Damson, another Ysolda-design. 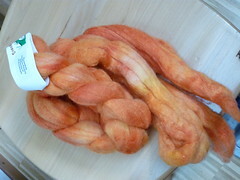 The Corriedale isn’t as soft as I would have loved it (I have since learned that that’s the nature of Corriedale). 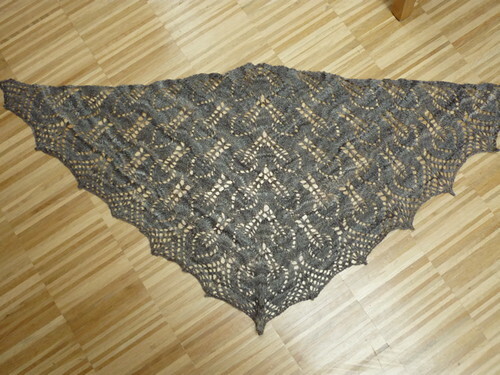 I was in such a hurry to make this that I didn’t even take a picture of the yarn or the finished shawl, the picture was taken by my father. You might ask yourself what do I need so many shawls for? Well, the orange one is mine (and I use it often) but the Gail is for a friend of mine who lost her father this year, and the Damson for one of my aunts who found out she had breast cancer a couple of months ago. Don’t worry, she’s doing fine and on the mend again. 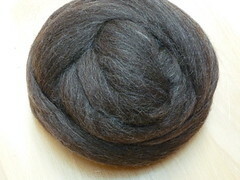 I’m just learning to spin and this is a very inspiring post for me! I love the tangerine color of the Ishbel.